The power of a dividend focused investment strategy is the ability to build a portfolio with an attractive current yield and have the income stream grow over time. Many dividend stocks have histories of regular dividend increases. You can put some extra pop into your brokerage account values by purchasing shares of growing dividend stocks before they come out with their next dividend increase announcement. The real estate investment trust (REIT) sector includes many companies that pay growing dividends and their shares have attractive yields. Most REITs announce a new, higher dividend rate once a year and then pay the new rate for the next four quarters. I maintain a REIT database that includes the timing of when the companies typically announce dividend increases as a data point for each REIT. The month before the next expected dividend increase announcement, is a good time to buy or add shares of a REIT that you expect to announce a higher dividend rate. When the market sees the higher rate, the share price often moves higher, and the result can be a nice short-term gain to the upside. You can use this information to either buy shares to hold for the longer term or as an intermediate term trade with the goal of making a profit on the typical high single digit to low double-digit share price gain that often comes with a higher dividend announcement. In many cases, the share price will continue to appreciate until just before the next ex-dividend date. 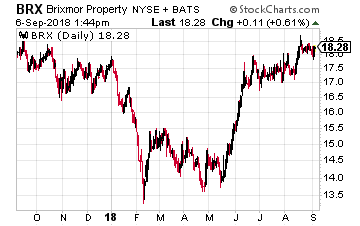 There are REITs that make their annual dividend increase announcements in every month of the year. The majority cluster in the last quarter or the first couple of months of the new year. As we move into October, there will be more opportunities to make this type of investment. Also, since in recent years September has been very volatile, you may be able to time your purchases to pick up shares when the overall market is in a down period. Let’s take a look at four REITs that should announce dividend increases in October. 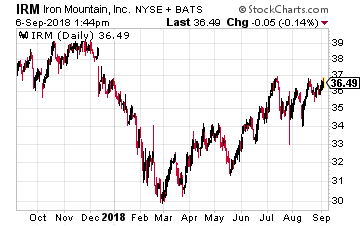 Iron Mountain Inc. (NYSE: IRM) is a niche REIT that provides information and asset storage, records management, data centers, data management and secure shredding services. The company has facilities and provides services in Asia, Europe, Africa and South America as well as in North America. The company converted to REIT status in 2014 and has increased the dividend each year since. Last year the payout was boosted by 6.8%. FFO per share growth has slowed in 2018, with management guiding to 4% dividend growth for the next several years. Iron Mountain announces its new dividend rate at the end of October with a mid-December record date and end of the year payment. Brixmor Property Group (NYSE: BRX) is an owner and operator of high-quality, open-air shopping centers. 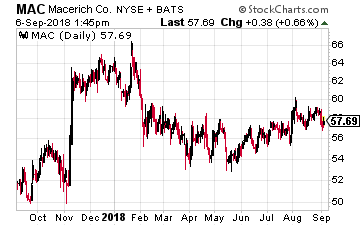 The Company’s more than 500 retail centers located primarily located in the eastern one-third of the continental U.S.
Brixmor went public in late 2013 and has increased its dividend each year, with typical 5% to 6% increases. Last year the dividend rate was boosted by 5.6%. The current dividend rate is less than 55% of the trailing twelve month’s FFO per share. I expect another 6% increase to be announced in late October. The new dividend rate is for the following year, with the first record and payment date of the higher rate occurring in January. Crown Castle International Corp (NYSE: CCI) owns cell phone towers, which are leased by the various wireless services providers. The company is the nation’s largest provider of shared wireless infrastructure. 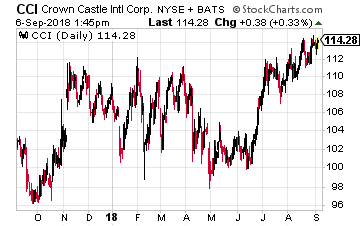 Crown Castle converted to REIT status in September 2013 and at that point started to pay dividends. Since the conversion, an increase was not announced for just one year: 2016. In 2017, the dividend was boosted by 10.5%. For 2018, management has guided to 10% per share AFFO growth, which means the next dividend increase should also be close to 10%. Crown Castle has announced a new higher dividend around the 20th of October with the record and payment dates in the last half of December. Macerich Co (NYSE: MAC) focuses on the acquisition, leasing, management, development and redevelopment of regional malls throughout the United States. Currently the company owns 48 “market dominant” Class A malls located across the U.S. Macerich has paid a growing dividend for over 20 years. Last year the quarterly payout increased by 4.2%. Management guidance is for 2018 funds available for distribution per share to be flat compared to last year. However, the current dividend rate is just 7% of projected FFO, and management is committed to continuing the annual dividend growth. I expect a moderate 3% to 4% dividend increase to keep the growth streak alive. A new dividend rate is usually announced in late October with a mid-November record date and early December payment date.